To tackle the limits of the literature investigating biofeedback training in children with secondary dystonia, the current study employs a wearable and silent EMG-based biofeedback device that aims at improving control over the impaired muscle by providing the patient with a vibration proportional to muscle activation. The device is tested on two children with secondary dystonia due to dyskinetic cerebral palsy in a 5-day training protocol during the execution of a figure-eight writing task. Data are compared with 5-day training with no intervention. Results show a positive effect of EMG-based biofeedback on the writing outcome. Indeed, for both subjects, the accuracy error of the figure-eight trace decreases with biofeedback training, while it does not present any significant change when children practice without the device. The promising results, together with the potential long-term use of the EMG-based vibrotactile biofeedback device, address the scarcity of noninvasive therapeutic interventions in the rehabilitation of childhood dystonia. Childhood dystonia is defined as a movement disorder in which involuntary sustained or intermittent muscle contractions cause twisting and repetitive movements, abnormal postures, or both . In terms of etiology, dystonia is classified as primary when it is the most important feature of an idiopathic or an identified genetic disorder, while secondary dystonias are symptomatic disorders arising from another underlying disease,typically cerebral palsy (CP) [2,3]. In particular, the dyskinetic form of CP is the most common cause of dystonia in children with a 0.15-0.25 per 1000 incidence in Western countries [4,5]. Physiological phenomena of dystonia include the presence of abnormal postures , overflow of motor activation to muscles different from the task-oriented ones , and co-contraction of antagonist muscles . In addition, although dystonia is regarded as a pure motor disorder, several sensory phenomena can occur, suggesting that sensory processing may be impaired . Evidence of sensory abnormalities characterizing dystonia brings about the hypothesis that incorrects sensory assistance to ongoing motor programs might result in motor impairments . In most cases, dystonia cannot be completely eliminated; treatment is merely symptomatic and the available interventions are either invasive, as for the case of deep brain stimulation, or only partially successful in controlling symptoms, as for pharmacological, physical and occupational therapies . For this reason, new noninvasive options for treating dystonia in children are strongly needed . Rather than a reduction of the dystonic symptoms, new therapeutic paradigms should address learning of the impaired motor function. In this framework, a possible solution may be represented by biofeedback techniques, which provide the patient with augmented information about physiological processes, thus increasing awareness and helping to gain increased voluntary control . Since sensory deficits have been shown to play a role in dystonia [9,14-16], using biofeedback to increase the awareness of muscle activity and direct attention to those muscles that are most responsible for movement errors might improve motor control and accelerate motor learning in children with dystonia. Since the 1970s, fairly intensive research has been investigating the effects of biofeedback therapy in children with motor disorders, such as CP and dystonia [17-24]. However, although most of these studies report a positive effect in motor rehabilitation, with improvements in motor control [25,26], mobility , and an increase in motivation to practice , the state of the art regarding the effectiveness of biofeedback training in children with movement disorders suffers two main limitations. In the first place, the proposed rehabilitation tools were not designed to be used outside clinical or laboratory settings; indeed, the encumbrance of the apparatus and the noisy and distracting type of cue used to convey information to the subjects did not allow for their use in domestic or social environments, such as school. Secondly, in terms of assessment of the effectiveness of this technique, there is the need for more sensitive outcome measures that have the capacity to capture small motor changes. Indeed, in most of these studies, the evaluation is based on qualitative interviews or questionnaires . To overcome the current limits of the literature investigating the efficacy of biofeedback training in children with CP and dystonia, we designed a detailed laboratory study to quantitatively test the efficacy of electromyographic (EMG)- based vibro-tactile biofeedback in accelerating motor learning and improving motor skill in children with secondary dystonia due to CP. One of the main innovations with respect to the state of the art is represented by the choice of the EMG biofeedback device. Indeed, current devices for surface EMG biofeedback are not appropriate for chronic use in children because they make noise, require conscious attention or effort, are not battery-operated, or are difficult to fit and adjust. In the current protocol, we propose the use of a battery-powered wearable EMG feedback device that indicates the level of muscle activity by proportionate changes in the speed of a silent vibration motor with a frequency that is proportional to muscle activation. These features potentially allow the child to wear the device multiple hours a day during daily activities. The current device was first used by Bloom and colleagues  in a study where they tested the efficacy of long-term biofeedback training in 10 CP children and they showed clinical improvement for all participants. Notwithstanding the important result, the study assessed changes in motor function using a clinical scale. Thus, in the current study, to address the need for sensitive and quantitative outcome measures, improvement in motor learning and skill are assessed through quantitative indices which were designed and validated in previous studies targeting the pediatric population affected by dystonia [31,32]. The study protocol tests the efficacy of biofeedback on children with secondary dystonia due to CP during the execution of a figure-eight writing task relevant to daily life. Among the possible activities of daily life, we chose handwriting because it is considered a very important action that occupies a high percentage of the child’s time at school . Moreover, handwriting skills are considered an essential contribution to self-esteem [34,35]. For the writing task, subjects were provided with a guideline trace (Figure 1) consisting of two circumferences with radius equal to 4 cm, which shared a point of tangency. This central trace was surrounded by a 2 cm wide channel. Subjects were instructed to use their index finger to follow the guideline trace with the maximum accuracy. This specific writing pattern was selected because it had already been successfully adopted by previous studies in the field [32,36] and, most importantly, because its peculiar frequency features the horizontal and vertical components present a 2:1 ratio) allow to run a specific spectral analysis able to quantify the extent of task-irrelevant components of muscle activity during task execution . 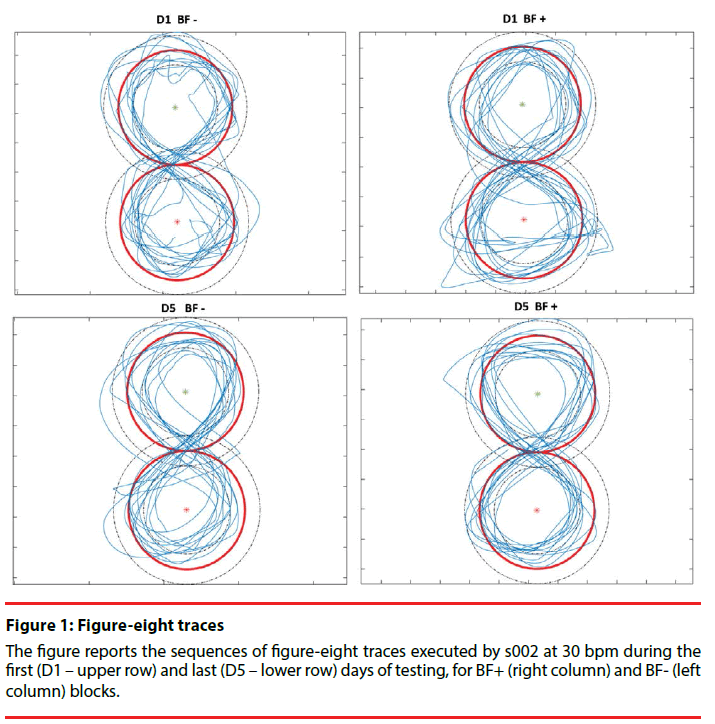 The figure reports the sequences of figure-eight traces executed by s002 at 30 bpm during the first (D1 – upper row) and last (D5 – lower row) days of testing, for BF+ (right column) and BF- (left column) blocks. For both the training and testing sessions, before the execution of each 10-movement sequence, the subject was asked to practice the required speed using a metronome. Once the subject was able to follow the correct pace, the metronome was switched off and the recording started. A 3-dimensional motion-tracking system (OEPSystem, BTS Bioengineering, Milan, Italy) consisting of eight infrared digital cameras working at 60 Hz was used for upper limb movement recording. A total of 13 semispherical 10-mm retroreflective markers were used to identify the position and the orientation of the trunk and the upper limb (arm, forearm, and hand), and the centers of the two circles that composed the figure-eight (Figure 2). For the current work, we analyzed data recorded from the marker placed on the index fingernail of the limb used to perform the task. The motiontracking system was synchronized to a wireless electromyography system (BTS FreeEMG 300, BTS Bioengineering, Milan, Italy (1000 Hz sample frequency). The bipolar surface EMG electrodes were positioned on eight muscles of the upper limb (Flexor Carpi Ulnaris (FCU), Extensor Carpi Radialis (ECR), Biceps Brachii (BIC), Triceps Brachii (TRIC), Anterior Deltoid (AD), Lateral Deltoid (LD), Posterior Deltoid (PD), and Supraspinatus (SS)). Kinematics and muscle activity were acquired during task execution in days of testing. The actual testing was also videotaped. 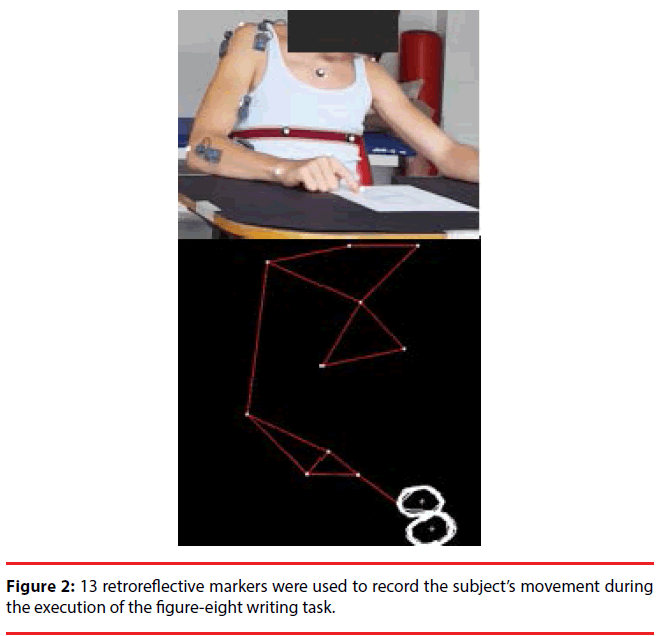 Figure 2: 13 retroreflective markers were used to record the subject’s movement during the execution of the writing-task writing task. During the days of training in the BF+ block, the subject was asked to wear the EMG-based vibro-tactile biofeedback device, which consists of an electrode head connected to a belt pack. The electrode head contains an active differential surface electrode to record the EMG activity of the target muscle. In addition, the vibration motor is mounted on the electrode, so that feedback occurs at the site of the active muscle, making the stimulus more salient and relevant and improving the ability to learn control. The control unit computes the force underlying the EMG signal through Bayesian estimation  and drives the vibrating motor with a vibration frequency proportional to the estimated force. The fast processor and the use of a nonlinear filter  allow the device to implement online proportional biofeedback. Finally, the belt pack contains a lithium-ion battery and the related battery charging circuit. Inclusion criteria for this study were: i) secondary dystonia due to dyskinetic CP affecting at least one upper limb; ii) pediatric age (6-18 years); iii) upper limb control impairment that does not prevent the writing task execution; iv) no cognitive impairment that prevents understanding of instructions. The current work presents the preliminary results obtained from two children (s001 and s002) recruited at the Medea Institute of Bosisio Parini (LC, Italy) (Table 1). Table 1: Preliminary results obtained from two children with secondary dystonia (s001 and s002) due to dyskinetic CP, recruited at the Medea Institute of Bosisio Parini (LC, Italy). For each patient independently, based on clinical examination, the target muscle was selected by the principal investigator, or study clinician as the most significant contributor to poor performance during upper limb motor tasks. More specifically, LD was selected as the target muscle for biofeedback training for s001, while ECR was picked for s002. For both subjects, the metronome was set at 20 (SP1), 25 (SP2), and 30 bpm (SP3) for the execution of half of the figure-eight pattern, corresponding to 6, 4.8, and 4 s, respectively, to complete one entire-figure-eight movement. The Medea Institute Ethical Committee approved the study protocol. Parents gave informed written consent for participation and authorization for use of protected health information. The participant gave written assent. The study was performed in accordance with the Declaration of Helsinki. Data analysis was executed with Matlab R2013b (Mathworks, Natick, MA). Statistical analysis was performed using RStudio, version 0.98.981 (RStudio Inc., Boston, MA). The main outcome measure for this task is the accuracy error (AccErr) of the figure-eight trace. AccErr was computed as the average, over time frames, of the absolute value of the difference between the distance of the fingertip (index fingernail marker) from the center of either the upper or lower circle, and the radius of the circle, normalized by the radius. Possible differences in AccErr were studied across Speed (3 levels), Day (2 levels: D1, D5), and Block (2 levels: BF-, BF+) using 3-way ANOVA. In terms of EMG parameters, we computed the Task-correlation Index (TCI) as an indication of the relative contribution of muscle activity correlated with the task. The index was specifically designed for children with dystonia in a previous study from our group  and is a measure to objectively distinguish and quantify taskcorrelated and task-uncorrelated components of muscle activity during the performance of continuous movements. The more noise that characterizes the EMGs, the more we expect TCI to decrease. Here, TCI is computed for each of the eight muscles. Using repeated measures ANOVA, possible differences in TCI are studied across Speed (3 levels), Day (2 levels: D1, D5), and Block (2 levels: BF-, BF+). S001 first achieved BF+, followed by BF-. Statistics reported a significant effect of Speed (p<0.001) on AccErr. Data showed that, as expected, AccErr tended to increase with increasing Speed (20bpm: 0.083 ± 0.019; 25bpm: 0.102 ± 0.032; 30bpm: 0.107 ± 0.027). Pairwise comparisons through post-hoc Tukey HSD test across the 3 speed levels highlighted significant differences between the AccErr at 20bpm and 25bpm (p<0.001), and between the AccErr at 20bpm and 30bpm (p<0.001). A significant effect of Day (p=0.025) was observed, with AccErr decreasing from D1 (0.101 ± 0.031) to D5 (0.093 ± 0.024). A significant effect of Block (p<0.001) was observed, unveiling a larger AccErr for BF- (0.106 ± 0.019), than for BF+ (0.090 ± 0.032). More importantly, a significant interaction between the two independent variables Block and Day was reported (p<0.001), showing that, for BF+, AccErr decreased from D1 to D5, while it did not present the same trend for BF (Figure 3). 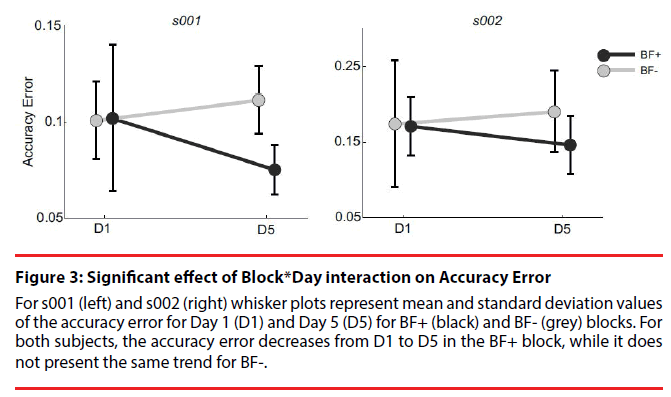 For s001 (left) and s002 (right) whisker plots represent mean and standard deviation values of the accuracy error for Day 1 (D1) and Day 5 (D5) for BF+ (black) and BF- (grey) blocks. For both subjects, the accuracy error decreases from D1 to D5 in the BF+ block, while it does not present the same trend for BF-. Statistics reported a significant effect of Speed (p=0.031) on TCI. However, pairwise comparisons through Bonferroni adjustment across the 3 speed levels did not highlight significant results. Overall, data showed that TCI tended to decrease with increasing Speed (20bpm: 0.44; 25bpm: 0.39; 30bpm: 0.35). A significant effect of Day (p=0.002) was observed, with TCI increasing from D1 (0.35) to D5 (0.44), while no effect of Block was found. S002 first achieved BF-, followed by BF+. For TCI, statistics reported a significant effect of Speed (p<0.001). Overall, data showed that TCI tended to decrease with increasing Speed (20bpm: 0.53; 25bpm: 0.51; 20bpm: 0.40). Pairwise comparisons through Bonferroni adjustment across the 3 speed levels highlighted significant differences in TCI between 20 and 30 bpm (p=0.004), and between 25 and 30 bpm (p<0.001). For s002, no effect of Day or Block on TCI was reported. The current work presents the successful preliminary results on the use of EMG-based vibro-tactile biofeedback training in two children with secondary dystonia due to dyskinetic CP. The key finding emerged from both our subjects is that biofeedback training has a positive effect on the writing outcome. Indeed, the accuracy error of the figure-eight trace decreased even with non-intensive biofeedback training for 5 consecutive days. Instead, when children practiced for the same amount of time without wearing the biofeedback device, our data did not report any significant improvement in the quality of the writing outcome. It is worth noting that the same result emerged for both subjects, even if they accomplished the experimental blocks in opposite order. Although we presented preliminary data on two subjects going through partially intensive training, results are promising and show the beneficial potential of the EMG-based vibrotactile biofeedback device in the rehabilitation of children with secondary dystonia. Indeed, since the present device was designed to be wearable and portable, its use can be easily extended to scholastic and/or domestic environments. This would allow the possibility to increase the training time with significant consequences in terms of improvement of motor control and acceleration of motor learning. For this reason, in terms of future direction, it is advisable to continue recruiting subjects for the ongoing laboratory-based study to quantitatively test the efficacy of EMG-based biofeedback training in children with dystonia and, at the same time, to test the feasibility of biofeedback training in a long-term protocol that requires the use of the present device in daily-life scenarios. In addition, it would be important to shed light on the long-term retention of improved function. The current study tests biofeedback training during the execution of an important daily life activity, such as handwriting. However, the device allows its use during multiple different tasks relevant to daily life, such as self-feeding or self-care. Moreover, we can speculate that daily biofeedback training will not just improve performance of the specific exercise, but will lead to generalization and improvement of other important upper-limb tasks [38,39]. Further research should be done to shed light on training transfer and long-term effect due to biofeedback. Because this study was not sham-controlled, we cannot determine the mechanism by which the biofeedback exerted its effects. We conjecture that because there was no explicit instruction to the children to attain a particular level of biofeedback, the primary mechanism in this case is due to increased attention to the relevant muscle. Attention is a strong modulator of learning, and it could potentially focus learning on the selective improvement of control over a muscle that was clinically determined to be causing impairment. We cannot exclude a less-specific mechanism, such as maintaining general interest in the task due to novelty, providing an alerting stimulus, or providing a distractor. Therefore while our results provide initial support for further clinical testing of biofeedback in secondary dystonia, they also suggest that future experiments targeted at understanding the mechanism of improvement could lead to even greater clinical effects. To this aim, it would be interesting to evaluate the effect of sham biofeedback training and biofeedback targeting muscles not directly involved in the accomplishment of the task. Using the Task-correlation Index, we showed the effect of training in reducing the extent of task-irrelevant components of muscle activity in one of the two children with secondary dystonia. Interestingly, data showed that, for both subjects, the Task-correlation Index tended to decrease with increasing speed. The finding is consistent with the hypothesis of signal-dependent noise , since increased speed of movement requires larger control signals, whose greater noise is captured by a decreased Task-Correlation Index. However, in terms or reduction of undesired muscle activity, the effect of biofeedback training requires more investigation: a larger sample size is a necessary requirement to understand if the use of biofeedback training represents a useful solution to reduce task-irrelevant noisy components of muscle activity. To conclude, these two preliminary case reports support the effectiveness of EMG-based biofeedback training in improving motor control in children with secondary dystonia. Indeed, for both subjects, the accuracy of the writing outcome increases even after 5-day biofeedback training. The promising preliminary results, together with the potential long-term use of the EMG-based vibrotactile biofeedback device, address the scarcity of noninvasive therapeutic interventions in the rehabilitation of childhood dystonia. Research supported by the Italian Ministry of Health (EUDAMED number: CIV-IT-15-01-013082). Sanger TD. Pediatric movement disorders. Curr.Opin. Neurol16(4), 529-535 (2003). Sanger TD, Chen D, Fehlings DL, et al.Definition and classification of hyperkinetic movements in childhood. Mov. Disord25(11), 1538–1549 (2010). Fahn S, Bressman SB, Marsden CD. ClassiÃ¯Â¬Âcation of dystonia. Adv. Neurol78:1e10 (1998). Hensleigh PA, Fainstat T, Spencer R. Perinatal events and cerebral palsy. Am. J. Obstet. Gynecol154(5), 978e981 (1986). Odding E, Roebroeck ME, Stam HJ. The epidemiology of cerebral palsy: incidence, impairments and risk factors. Disabil.Rehabil28(4),183-191 (2006). Albanese A, Bhatia K, Bressman SB, et al. Phenomenology and classification of dystonia: a consensus update. Mov. Disord28(7), 863-873 (2013). Sanger TD. Toward a definition of childhood dystonia. Curr.Opin.Pediatr16(6) 623-627 (2004). Berardelli A, Rothwell JC, Hallett M, et al. The pathophysiology of primary dystonia. Brain 1195-1212 (1998). Abbruzzese G, Berardelli A. Sensorimotor integration in movement disorders. Mov. Disord18(3), 231-240 (2003). Sanger TD. Failure of motor learning for large initial errors. Neural. Comput16(9), 1873-1886 (2004). Bertucco M, Sanger TD. Current and emerging strategies for treatment of childhood dystonia. J. Hand Ther28(2), 185-194 (2015). Casellato C, Pedrocchi A, Zorzi G, et al.Error-enhancing robot therapy to induce motor control improvement in childhood onset primary dystonia. J.Neuroeng.Rehabil23(1), 9:46 (2012). Basmajian JV. Research foundations of EMG biofeedback in rehabilitation. Biofeedback. Self. Regul13(1), 275e298 (1988). Sanger TD, Kukke SN. Abnormalities of tactile sensory function in children with dystonic and diplegiccerebral palsy. J. Child. Neurol22(3), 289-293 (2007). Lesný I, Stehlík A, Tomásek J, et al.Sensory disorders in cerebral palsy: two-point discrimination.Dev. Med. Child. Neurol35(5), 402-405 (1993). Auld ML, Boyd R, Moseley GL, et al.Tactile function in children with unilateral cerebral palsy compared to typically developing children. Disabil. Rehabil34(17), 1488-1494 (2012). Wooldridge CP, Russell G. Head position training with the cerebral palsied child: An application of biofeedback techniques. Arch. Phys. Med. Rehabil57(9), 407-414 (1976). Bertoti DB, Gross AL. Evaluation of biofeedback seat insert for improving active sitting posture in children with cerebral palsy. PhysTher 68(7), 1109-1113 (1988). Casellato C, Maggioni S, Lunardini F, et al.Dystonia: Altered Sensorimotor Control and Vibro-tactile EMG-Based Biofeedback Effects. XIII Mediterranean Conference on Medical and Biological Engineering and Computing 2013. L. M. Romero ed. 1742-1746 (2014). Bolek JE, Mansour L, Sabet A. Enhancing proper sitting position using a new sEMG protocol, the “Minimax” procedure, with Boolean logic. Appl.Psychophysiol. Biofeedback26(1), 09-16 (2001). Yoo JW, Lee DR, Sim YJ, et al.Effects of innovative virtual reality game and EMG biofeedback on neuromotor control in cerebral palsy. Biomed. Mater.Eng24(6), 3613-3618 (2014). Fluet GG, Qiu Q, Kelly D, et al. Interfacing a haptic robotic system with complex virtual environments to treat impaired upper extremity motor function in children with cerebral palsy. Dev. Neurorehabil13(5), 335-345(2010). Sukal-Moulton T, Clancy T, Zhang LQ, et al.Clinical application of a robotic ankle training program for cerebral palsy compared to the research laboratory application: does it translate to practice? Arch. Phys. Med.Rehabil95(8), 1433-1440 (2014). Golomb MR, McDonald BC, Warden SJ, et al.In-home virtual reality videogame telerehabilitation in adolescents with hemiplegic cerebral palsy. Arch. Phys. Med. Rehabil91(1), 01-08 (2010). Young, SJ, van Doornik J, Sanger TD. Visual Feedback Reduces Co-Contraction in Children with Dystonia. J.Child.Neurol26(1), 37-43 (2011). Casellato C, Pedrocchi A, Zorzi G, et al. EMG-based visual-haptic biofeedback: a tool to improve motor control in children with primary dystonia. IEEE. Trans. Neural. Syst. Rehabil. Eng21(3), 474-480 (2013). Nash J, Neilson PD, O’Dwyer NJ. Reducing spasticity to control muscle contracture of children with cerebral palsy. Dev. Med. Child.Neurol31(4), 471-480 (1989). Tam C, Schwellnus H, Eaton C, et al.Movement-to-music computer technology: a developmental play experience for children with severe physical disabilities. Occup.Ther. Int14(2), 99-112 (2007). Gaebler-Spira D, Peri E, Lunardini F, et al. "Rehabilitation Technologies for Cerebral Palsy”, in Emerging Therapies in Neurorehabilitation II, Pons JL, Raya R, González J (Eds.). Springer (2016). Bloom R, Przekop A, Sanger TD. Prolonged electromyogram biofeedback improves upper extremity function in children with cerebral palsy. J. Child. Neurol25(12), 1480-1484 (2010). Lunardini F, Bertucco M, Casellato C, et al.Speed-AccuracyTrade-OffinaTrajectory-ConstrainedSelf-FeedingTask:AQuantitativeIndexof Unsuppressed Motor Noise in Children With Dystonia. J. Child.Neurol30(12), 1676-1685 (2015). LunardiniF,MaggioniS,CasellatoC,et al.Increased task-uncorrelated muscle activity in childhood dystonia. J. Neuroeng. Rehabil12(1), 52 (2015). McHale K, Cermak S. Fine motor activities in elementary school: preliminary Ã¯Â¬Ândings and provisional implications for children with Ã¯Â¬Âne motor problems. Am. J.Occup.Ther46(10), 898-930 (1992). Feder KP, Majnemer A. Handwriting development, competency and intervention. Dev. Med. Child.Neurol49(4), 312-317 (2007). Steward S. Development of written language proÃ¯Â¬Âciency: methods for teaching text structure. In: Simon C, editor. Communication skills and classroom success. Eau Clarie, WI: Thinking Publications, 419-432 (1992). Casellato C, Zorzi G, Pedrocchi A, et al.Reaching and writing movements: sensitive and reliable tools to measure genetic dystonia in children.J. Child. Neurol26(7), 822-829 (2011). Sanger TD. Bayesian filtering of myoelectric signals. J. Neurophysiol 97(2), 1839-1845 (2007). Issurin VB. Training transfer: scientific background and insights for practical application. Sports. Med43(8), 675-694 (2013). Grand KF, Bruzi AT, Dyke FB, et al. Why self-controlled feedback enhances motor learning: Answers from electroencephalography and indices of motivation. Hum.Mov.Sci43(1), 23-32 (2015). Harris CM, Wolpert DM. Signal-dependent noise determines motor planning. Nature394(1), 780-784 (1998).